Yesterday, Monday 25th October, me and my team went on an agricultural research trip to Siem Reap. For the past few months, I have been looking into supporting women farmers in my own consistuency, Battambang Province. Some very successful NGOs have offered to help me, including CADF and the Agricultural Development Denmark Asia (ADDA), both based in Siem Reap. 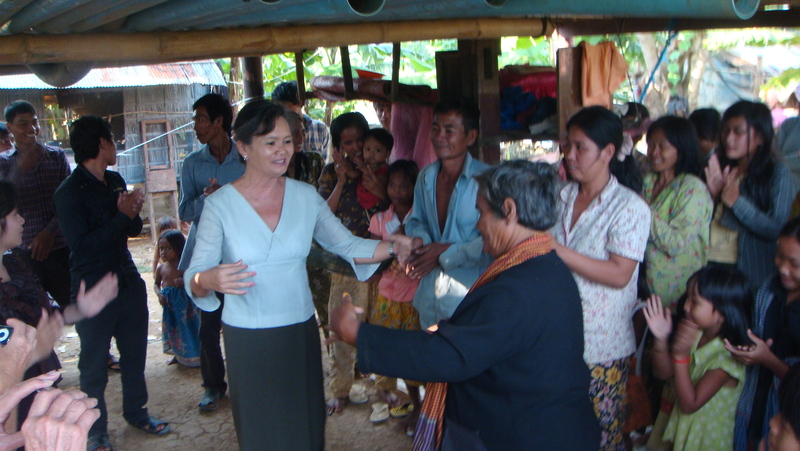 The latter focuses on women farmers empowerment in 3 Cambodian provinces (Siem Reap, Bantey Meanchey, and Battambang), with the support of the EU and WB notably. We met with some of their representatives to discuss their model and work with local women, as well as to discuss directly with some of the women involved (visiting their farms and community groups). After this trip, we will work on developing our own system in Battambang, following local women’s needs and desires, as well as market demand and supply there, but using some of the tools already successfully put in place by ADDA notably. Many prominent NGOs based in Phnom Penh continue to follow this case. 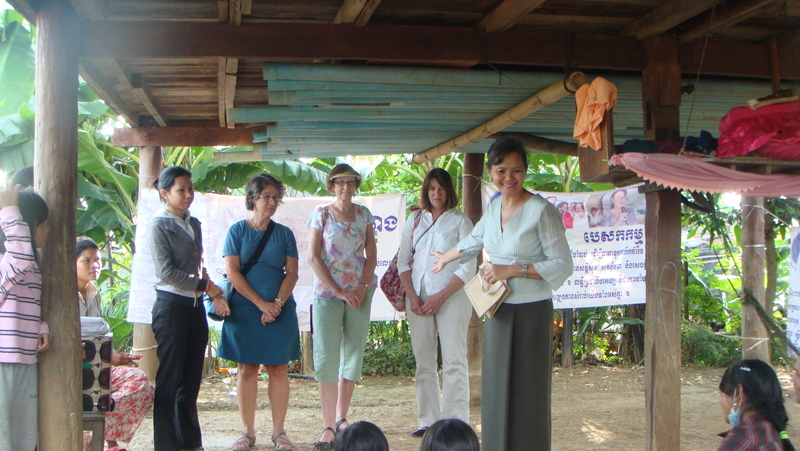 Before Pchum Ben Day various organizations met with the villagers who have a very strong commitment to help Mrs. Lem Nath, and even stronger after outside assistance stepped in. Even though they have been threatened and bribed by the authorities, they still stand with Lem Nath. We continue to push for support for Lem Nath, Cambodian justice, and will help our collaborators to find further evidence. This photo is of Tuon Mon. The litigator against Lem Nath claims that she forged Tuon Mon’s thumb print. However, Tuon Mon explains that she agreed to sign and that more than anything she wants Lem Nath to return home. Lem Nath is still imprisoned. The court case continues. I will post more information as it becomes known. We were so thrilled this evening to bring an incredible three-day summit to a close with the staging of our documentary play, SEVEN, featuring seven acclaimed Indian actresses. Shabana Azmi, celebrated actress and women’s advocate, championed our Delhi production, taking it upon herself to engage fellow actresses in the staging after being moved by the SEVEN script depicting the real life stories of remarkable heroines in the Vital Voices Global Leadership Network. A packed audience of summit delegates and international guests was in attendance for the first production of SEVEN in Asia. Featured actresses included: Shabana Azmi in the role of Inez McCormack;Urmila Matondkar in the role of Farida Azizi; Tannishtha Chatterjee in the role of Hafsat Abiola; Mahira Kakkar in the role of Mukhtar Mai; Mahabanoo Mody Kotwal in the role of Anabela de Leon; Tanvi Azmi in the role of Marina Pisklakova-Parker; and Jayati Bhatia in the role of Mu Sochua. After what was one of the most moving productions of SEVEN to date, our summit moderator, Zain Verjee, welcomed the performing actresses to the stage once more for a brief question and answer session. Cambodian parliamentarian and long-time Vital Voices Global Leadership Network member Mu Sochua, one of the seven women portrayed in the documentary play, joined Zain and the actresses on stage alongside Vital Voices Vice President for Human Rights, Cindy Dyer. Cindy Dyer recognized the sponsoring partners for the evening, the Avon Foundation for Women, and appealed to delegates to make use of a domestic violence toolkit produced by Vital Voices in collaboration with Avon; the toolkit includes strategic methods for advocacy, such as staging a reading of SEVEN to highlight the tremendous struggle and achievement of these remarkable women. The third plenary session of our summit focused largely on assessing women’s role in politics, titled Overcoming the Obstacles to Equality, Development and Peace: A Global Roundtable to Commemorate the 15th Anniversary of the UN Fourth World Conference on Women. Summit moderator Zain Verjee asked panelists to share their personal experience of overcoming barriers — social, structural, cultural and governmental. Sochua urged that women “not shy away from politics,” because every issue that affects women’s daily lives is in some way a political issue. Governor of Uttarakhand state in India and former Vital Voices Global Leadership Award honoree, Margaret Alva, echoed Sochua’s call for women’s engagement in the political realm. In her 30 years of political activism, Margaret says that she has seen women make considerable strides and now sees a shift materializing in India, owing largely to the adoption of a quota reserving seats for women in the Panchayat, or local bodies of governance. There are currently one million politically active women engaged at the grassroots level in India, says Margaret, but their one-year term limit ought to be reexamined to ensure that they have the opportunity to have a lasting impact. 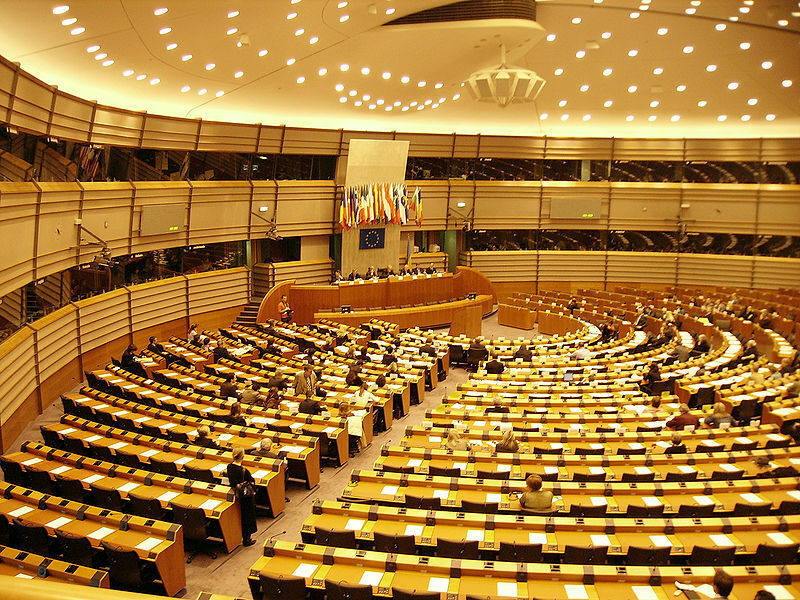 Women also need to reach out to male counterparts in politics, forming coalitions and networks of support to bolster their campaigns for change and increase chances of success by acting as a collective. 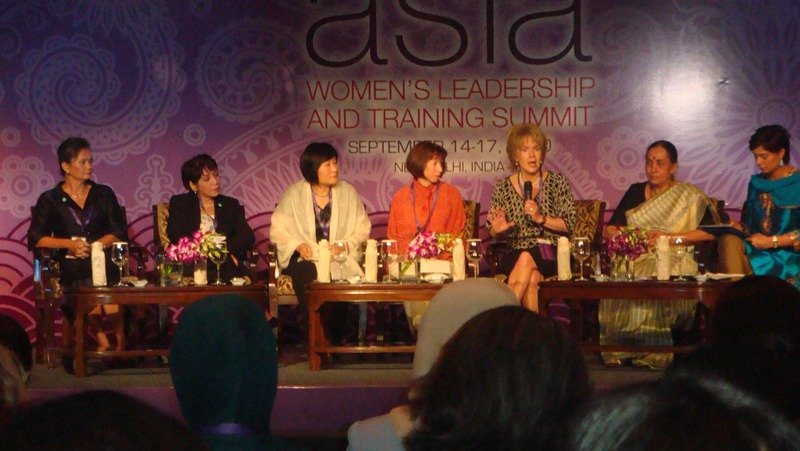 Ambassador Sally Shelton-Colby echoed Margaret’s appeal for collaborative efforts, advocating for the employment of unified bodies for action on global issues affecting women. Sally appealed to delegates convened to join in the Breakthrough Initiative, a project of Vital Voices’ multi-partner La Pietra Coalition to Advance Women and the World. Members of the Breakthrough Initiative include two Nobel Laureates, Muhammad Yunus and Amartya Sen.
Panelist Barbara Cooperman of LexisNexis spoke about the Rule of Law Index project, which pursues an integrated approach to strengthening societies through judicial reform, finding that this has ripple effects in social and economic spheres. Research compiled for the Index examines the practical effects of legislation in the daily lives of women and men. Patricia Sarenas of the Philippines, deputy director of the Mindanao Commission on Women, shared the success she has found in engaging judges and chief justices in the drafting of laws; Patricia said that it’s critical to involve the judiciary arm of government in the writing of laws, since they are the members who will be implementing the laws. 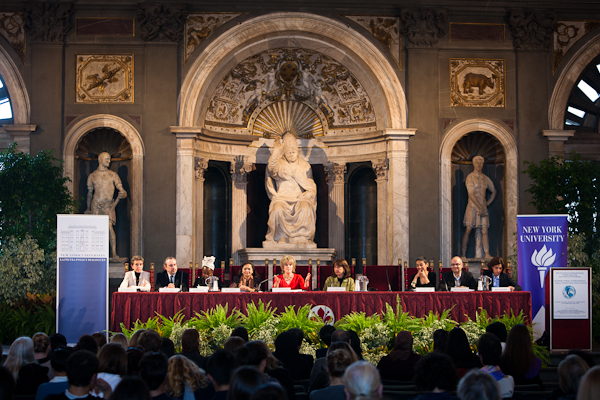 Mu Sochua and over 60 women and men attended La Pietra Coalition to advance women and the world, in Florence-Italy, from 9-11 October, 2010. The members who come from different sectors in different regions discussed their common goals of making investments in women as smart investments. Discussions were based on the Economic Intellligence Unit that recently released a report on the Women’s Economic Opportunity Index. Four main topics were discussed in four task forces: 1/ Labor policy and practice; 2/ Access to finance; 3/ Education and training; 4/Legal status. 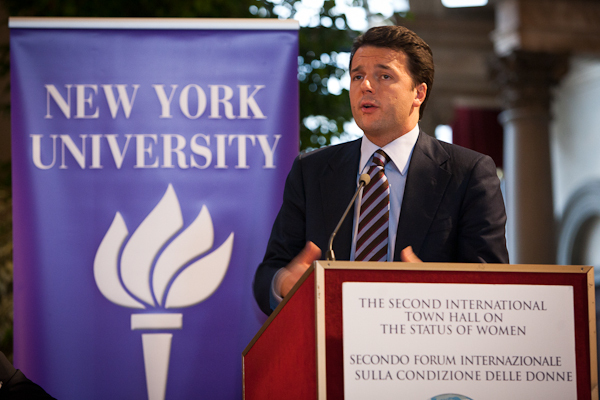 Mayor Renzy also known as “the Italian Obama” for his young and dynamic leadership hosted a Town Hall Forum attended by his citizens who came to raise more questions about advancement of women and girls globally and in Italy specifically. Mu Sochua put the emphasis on the social, economic and political context under which women and girls are developing and by appealing for a global action to help break the silence and provide safety and access to justice by opening her address with ” the absence of war does not the mean the presence of rights and safety for women and girls if society continues to condone gender based-violence and if equal opportunities are not present for all”.